Thinking that this must be an error (since it used to work fine before), I called up HSBC’s customer service hotline to find out what was going on. I was shocked to hear that HSBC now officially only supports IE, and no other browsers are supported for Verified by Visa. I asked them what I’m supposed to do if I have a Mac and don’t have IE, and they responded that I’m supposed to use IE or nothing at all. I asked why Firefox is unsupported since it used to work fine before and they gave a vague response that Firefox cannot exchange data with Visa properly (which does not make sense at all). They also said that their entire online platform is “built for Internet Explorer”. 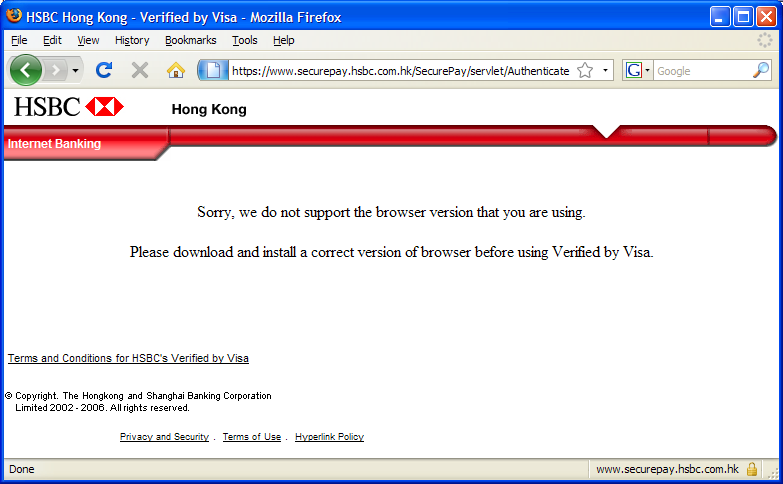 The message from HSBC Hong Kong is clear: if you’re not using IE, don’t bother making online purchases with our Visa card. My message to HSBC is this: if you’re not going to support Firefox, don’t count on me using your Visa card to make any purchases (online or offline).